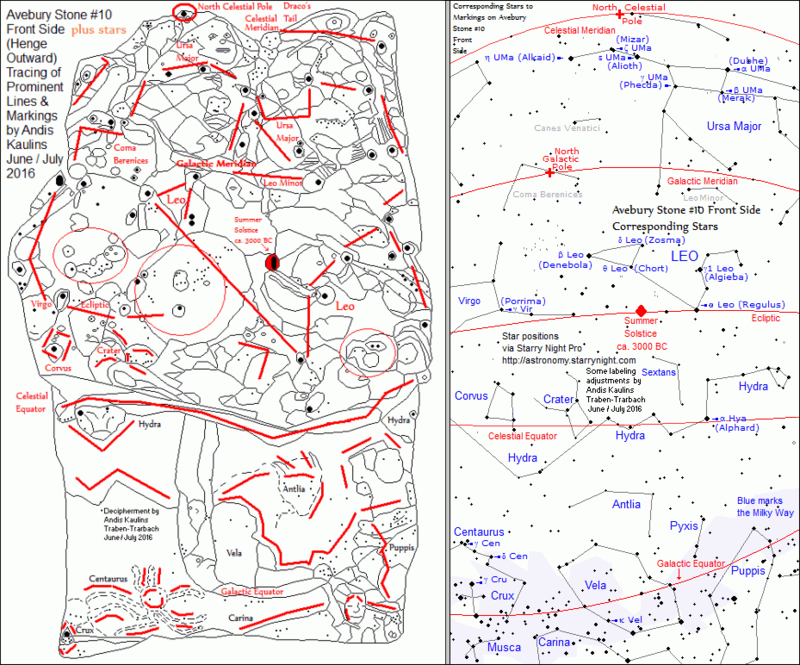 This image compares the black/white tracing result for Avebury Stone #10 with the corresponding stars in a modern sky map. Both mark the same stellar region, 5000 years apart in astronomical technology. 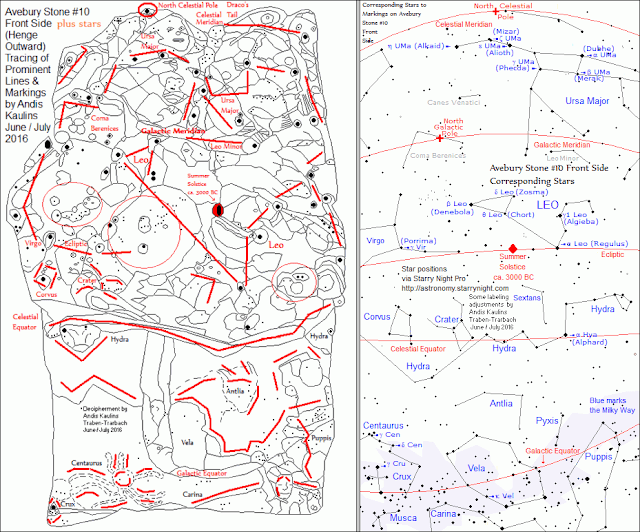 The sky map on the right is a partial clip from the superb astronomy software program Starry Night Pro http://astronomy.starrynight.com. We have moved labels around so that the image comparison is easier to view here. Click the pic to see a larger image. The top of Avebury Stone #10 marks the Celestial Meridian. When you look at that top of the stone, you see that the ancients split Ursa Major into two halves that marked the heads of the two large figures, a man and a woman. The necks of the heads mark the Galactic Meridian. The child in their laps is marked by Leo, with Leo Minor marking either more children of the family or dolls of the large child. The man wears boots and one can see the shape of the shoe in the Milky Way with a jagged cut. The woman's dress extends to the bottom of the image, although the right lower half of the stone also might represent a sperm whale's head below the Celestial Equator, which is marked by Hydra at the middle of the intentionally sheared megalith. Also an octopus or squid is marked in the watery regions, at the lower left and a whale at the lower right below the funerary sled. The bottom of the stone marks the Galactic Equator. The center of the Stone marks the Summer Solstice. The North Galactic Pole at Coma Berenices is marked by what could be a phallic symbol. As we interpret the figures on stone, the upper half of the stone represents the realm of the living on Earth whereas the lower half is the realm of the deceased, marked by several figures that can be interpreted as those who have passed away, including one on a sled, which must have transported the deceased into the watery underworld. Puppis in the right corner is drawn as the similarly named Apophis (Apep), the giant serpent of the deep who was thought in early ancient times to consume the dead. Crux, the Southern Cross, is in the left lower corner and may have served in prehistoric days, as in modern eras, as a symbol of passage. Antlia is a modern constellation, very faintly marked here by what appears to be an animal of some kind. It was seen as a hunting boomerang by aboriginals in Oceania, a normally irrelevant connection, except for a figure we found dimly marked on the right hand side of the stone that could appear to be throwing something like a hunting boomerang could be. Interesting.